Share the post "Why Does DREAM THEATER’s MIKE MANGINI Set His Cymbals So High? 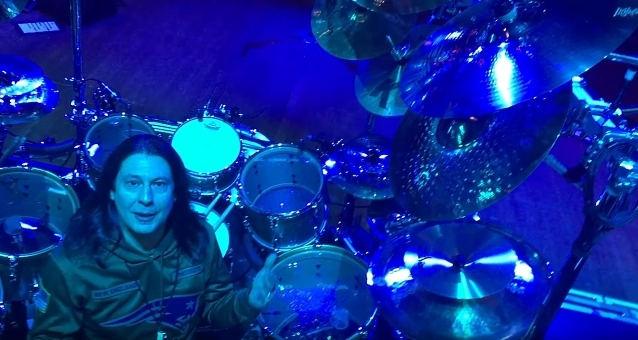 He Explains"
Mangini was asked by Music Radar why he placed the cymbals so high above him during the recording sessions for DREAM THEATER‘s latest studio album, “Distance Over Time”. “Here we go! The cymbals!” he said. “I went to an extreme to make it so the cymbals would be louder and more clear in the final mix. That stuff is out of my hands, it’s always been out of my hands, so I was trying to do everything possible to make it so that they were as clean as could be because there is so much leakage from my kit. “I hit harder than people think,” he continued. “I don’t look like I hit hard, but I’m scientifically measured, I’m hitting as hard at 20 beats a second as at four beats a second. It doesn’t look like it, I look like a robot, but that’s because I play like a Bruce Lee punch. “So I’m, like, ‘Okay, let me get the overheads out of the way, way up. In fact, there were no overheads, the mics were underneath, aiming up to get away from how hard I hit the snare. It doesn’t look like it, I know that. With DREAM THEATER, I’m in the band, but I’ve been down on the totem pole as far as direction. NEXT POST Next post: Full of Hell’s “Silmaril”: Heaviest Tolkien-Inspired Song Ever?